Secondary Inscription: Inscribed front pastedown, upper outer edge, in pen, "Nolitte fieri sicut ecus mullus et intellectus. J. Sassard"; upper center, in pen, "Le dixiesme Apuril 1599 ce liure a este donne a moy... par la Combe mon rentier de ... lequel cest cy sousigne. A Pollet"; below this, in another hand, in pen, "Paleae non sunt in hoc manuscripto: et ideo donatio Constantini, quae est impressis c. Constantinus Dist. 96 abest. "; outer upper edge, in pencil, "Nr.8" (encircled). Inscribed back flyleaf, upper edge, in pen, "reliqua in hoc volumine nobis donato decima Aprilis 1599 desiderantur quod volumen nobis donatum fuit ab antonio Pollet combeo"; in center, "17". Inscribed back flyleaf verso, upper edge, in pen, "Fr Buccinoy ... este putes et lauds". Inscribed back pastedown, lower outer corner, in pencil, "OA158" (158 underlined). There are marginal and interlinear glosses and notes by an early (late twelfth century) reader on a number of pages. As a teacher at the University in Bologna sometime between 1140 and 1150, Gratian, who was also a monk, organized the study of church law with his compilation of the Decretum. This unprecedented gathering of nearly four thousand texts was drawn from Early Christian writings, papal pronouncements, and council decrees. As the most comprehensive manual of canon law, it quickly became a standard textbook for university students throughout Europe. 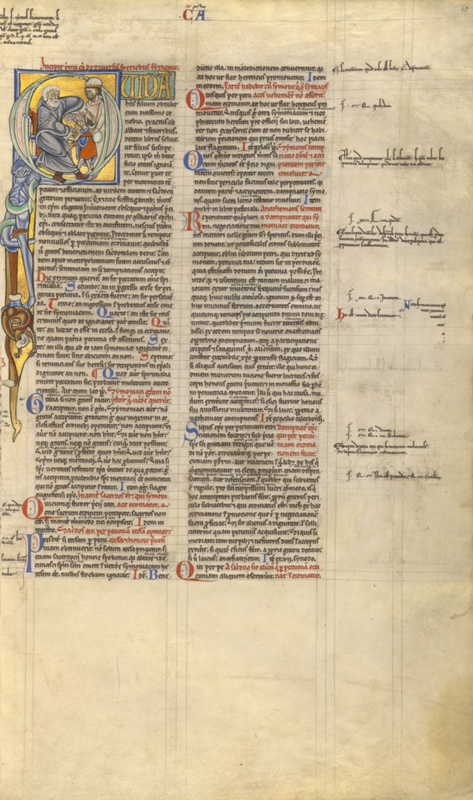 The Getty Museum's manuscript of the Decretum, dated about 1170 to 1180, is richly illuminated, with two full-page miniatures and a variety of historiated and decorated initials that mark divisions of the text. The northern French Romanesque style of the illuminations was strongly influenced by English art. This type of decoration links the manuscript to a group of books produced for Thomas Becket, Archbishop of Canterbury, and his secretary while they were in exile in France. 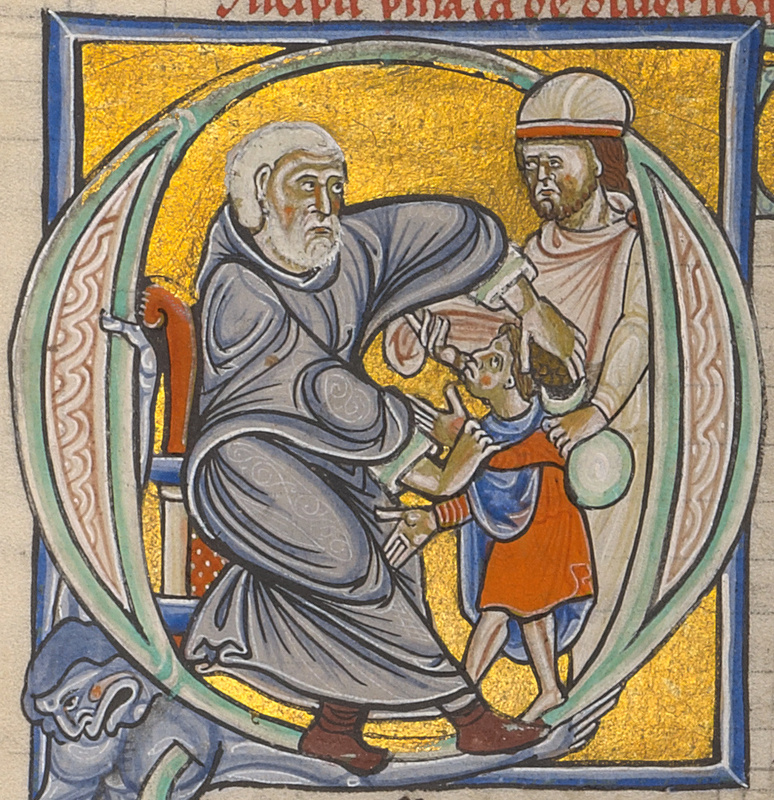 Made by anonymous craftspeople, it is not clear whether the Museum's manuscript and the other books in this group were painted in Sens, the site of Becket's exile, or in nearby Paris. von Euw, Anton, and Joachim M. Plotzek. Die Handschriften der Sammlung Ludwig. 4 vols. (Cologne: Schnütgen-Museum, 1979-1985), vol. 4 (1985), pp. 41-48. The J. Paul Getty Museum Handbook of the Collections. 1st ed. (Malibu: J. Paul Getty Museum, 1986), p. 70, ill. The J. Paul Getty Museum Handbook of the Collections. 2nd ed. (Malibu: J. Paul Getty Museum, 1988), p. 70, ill. 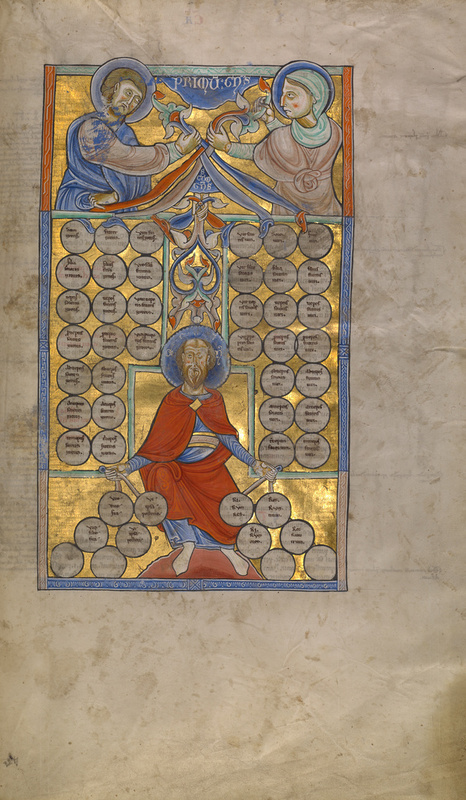 Masterpieces of the J. Paul Getty Museum: Illuminated Manuscripts (Los Angeles: J. Paul Getty Museum, 1997), pp. 28-29, entry by Adam S. Cohen. Löfstedt, Leena. "Une tradition bilingue." In Neuphilologische Mitteilungen: Bulletin de la Société néophilologique 105:3 (2004), pp.279-86. Löfstedt, Leena. "Quelques bribes marginales et interlinéaires d'un grand travail medieval." In Cultura Neolatina: Rivista di Filologia Romanza fondata da Giulio Bertoni 65:3-4 (2005), pp.219-232. Stirnemann, Patricia. "En quête de Sens." In Quand La Peinture Était dans les Livres. Hofmann, Mara and Caroline Zöhl, ed. (Brepols: Bibliothèque nationale de France, 2007), pp. 305 and 310. Kren, Thomas. French Illuminated Manuscripts in the J. Paul Getty Museum (Los Angeles: J. Paul Getty Museum, 2007), pp. ix, xi, xxix, 8-11, ill.
Wolter-von dem Knesebeck, Harald. "Deutschland." In Romanik. Geschichte der Buchkultur. 9 vols. Andreas Fingernagel, ed. (Graz: Akademische Druck- u. Verlagsanstalt, 1999-2007), vol. 4 (2007), pp. 158, 160f. Morrison, Elizabeth. Beasts: Factual & Fantastic (Los Angeles: J. Paul Getty Museum; London: The British Library, 2007), pp. 78, 80-81, fig. 64. Bittles, Alan H. Consanguinity in Context (Cambridge: Cambridge University Press, 2012), pl. 2.1, 2.2. Murano, Giovanna. "Graziano e il Decretum nel secolo XII." Rivista Internazionale di Diretto Comune 26 (2015), p. 120. Löfstedt, Leena. "The MS. Ludwig XIV 2 (the 'Getty Gratian') and the Old French Decretum Translation." Romanica Cracoviensia 15 (2015), pp. 192 – 215. Löfstedt, Leena. "The ∑–group of Decretum Manuscripts, the ‘Getty Gratian’, and the Old French Translation of the Text.” In Le badaud et le regardeur. Edited by Jakub Kornhauser and Iwona Piechnik, 256-294. Krakow: Biblioteka Jagiellonska, 2017.